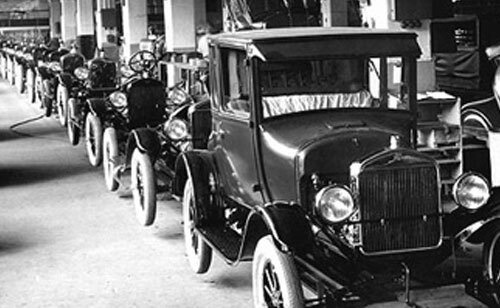 "As it was in the beginning..."
In the beginning, automobiles did not have windshields. Goggles were the only protection from inclement weather, insects and other road debris. The first windshields were hand cut from plate (annealed) glass. Plate glass shatters into large, dangerously sharp pieces when broken. To avoid this safety hazard, Henry Ford introduced laminated safety glass windshields in the mid-1920s. Laminated glass consists of two layers of glass sandwiched around a layer of polyvinyl butyrate (PBV). Laminated glass is ideal for windshield use. When damaged, the broken glass adheres to the PVB inner layer instead of showering vehicle occupants with dangerous shards of glass. Also, laminated glass exerts a "cushioning" effect to protect vehicle occupants during collisions.The PVB inner layer absorbs the impact energy and keeps occupants from being ejected through the windshield opening. Tempered glass, sometimes called "toughened glass", is also considered safety glass. Strengthened through the application of heat and pressure, tempered glass is usually used for vehicle side and back windows. When broken, tempered glass crumbles into rounded glass pebbles. Laminated safety glass can normally be repaired; tempered glass cannot. Windshields have evolved into complex, engineered glass systems with heating elements to melt ice, or coatings to repel ultra-violet radiation. Shade bands, radio & telephone antennas, satellite uplinks, heads-up holographic instrument displays, or even sensors to activate windshield wipers or close convertible tops are now common. The modern windshield is also thinner and lighter to reduce overall vehicle weight and thereby contribute to increased fuel economy. In short, societal expectations have influenced engineers to design enhancements into the glass and, in so doing, have made windshields more costly to produce. Increased windshield performance comes at a cost of higher prices. In the early 1990's, increased prices created an economic incentive to repair rather than replace windshields. 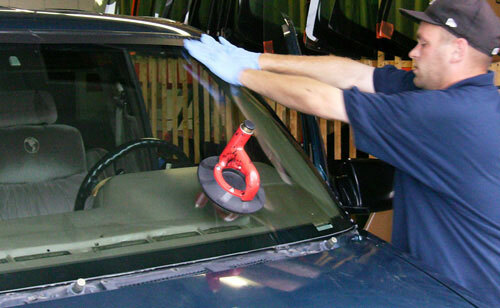 Prior to 1990, fewer than 500,000 damaged windshields were repaired every year. Today, over 3 million Americans choose repair annually. The reason average replacements cost between $250 and $1,000; the average repair is between $50 and $75, depending on the number of breaks.